When people think of Brazil what usually springs to mind is football, carnaval and caipirinhas. Thankfully my evening last night considered of just the latter two – dance and drink! Let’s face it – who can throw themselves into a sweaty samba session without at least one cocktail? Obviously not me. Nor the rest of the Motley Crue of bloggers who joined the fray and danced the night away. Harriet Thorpe is set to host and narrate West End concert of new LGBT musical Facing East, raising awareness for Stonewall and Pride. The concert will take place on Monday 22nd June at London’s Lyric Theatre on Shaftesbury Avenue. I carried a pineapple… and had the time of my life! A room full of people who love theatre and love to write about it. It must be the #LDNTheatreBloggers hooking up for stagey talk and lots of wine. The problem with handbags is that sometimes they’re just not big enough… I mean when you go to the theatre the programmes and photo brochures are just so big that they just don’t fit! Luckily, help has arrived in the form of the most swankified tote bag there is. 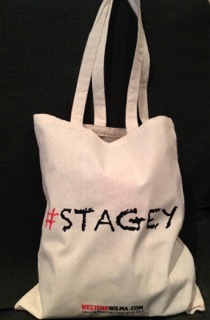 Yes, the lovely West End Wilma has created the #stagey bag! When a London show claims to pay homage to one of the greatest music artists ever, you expect it to be as legendary as the man itself. 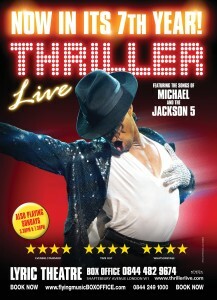 Sadly Thriller Live fails miserably and is more like an X-Factor special than a tribute to Michael Jackson.